Seeing Ink Spots: This Weekend's Workshop! One of my favorite things to do is workshops. Yesterday I was lucky to be in my friends home to show some new and old techniques. The old technique was the use of Crystal FX. 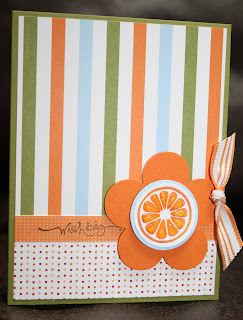 I showed the new Die Cut Blooms and Picnic DSP with the Tart and Tangy stamp set. I was inspired by a card I saw online to add the Crystal FX to the orange slice stamp which takes this card from cool to SUPER COOL. The new technique I shared at the workshop was how to custom dye the flowers from the Pretties Kit. We first painted the flower with an Aqua Painter and plain water. Then we touched reinker direct to the flower and distributed the ink with an Aqua Painter. We heat set them for a quick dry and then applied Dazzling Diamonds glitter with the Tombow Multi Purpose Adhesive. The finished card is 5.25" square Purely Pomegranate with square patches of Too Cute DSP. YES! I have never been able to do that! Love the blog, I have really missed seeing your work, since we moved to ooooh-tah. Welcome to the blogging world!!! I love your work and can't wait to check in often for inspiration.